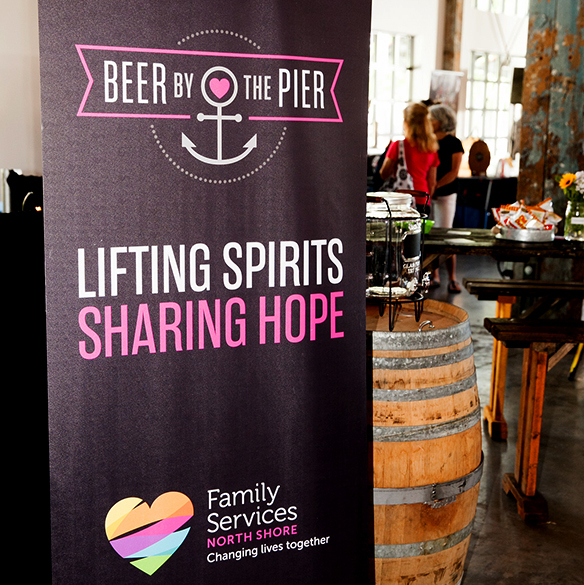 Modern branding for this annual fundraiser needed to balance the upbeat, celebratory nature of the event with a sober call to support North Shore families in need. The new program tagline – Lifting Spirits, Sharing Hope – also reflects the core mission. 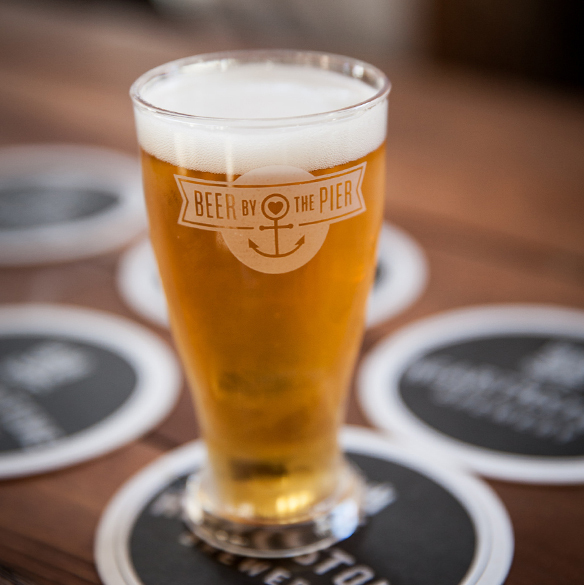 As the event gains both financial and community momentum, Beer by the Pier consistently sells out and exceeds its single-day fundraising targets. 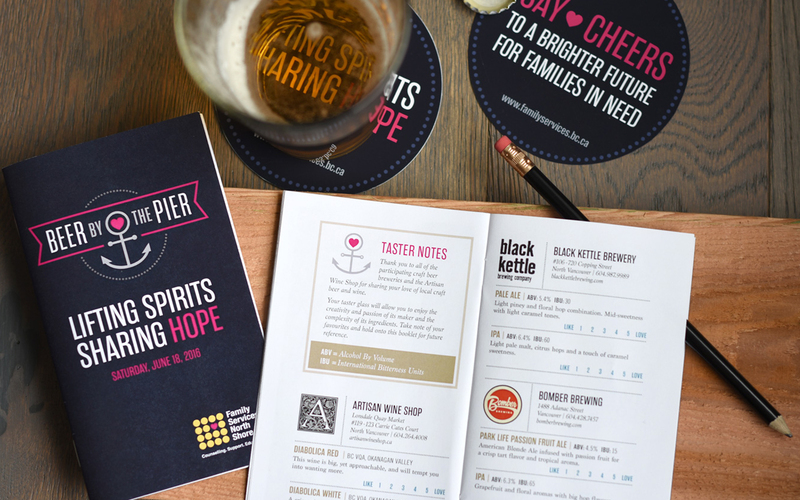 Family Services of the North Shore (FSNS) – a community-based non-profit that serves over 8,300 individuals and families annually – asked White Crow to develop custom branding for their new Beer by the Pier fundraising program. This once-a-year event raises money for local children, youth and families who need the organization’s support. Featuring craft breweries, live music, a silent auction, and catered food, it’s a lively evening that serves a vital community purpose. The project presented a welcome creative challenge for our team, as the new branding needed to balance the upbeat, celebratory nature of the event with a sober call to support North shore families in need. For the logo design, we integrated both the FSNS “heart” icon and an anchor that references the Shipbuilders’ Square venue. The new branding is bright, hopeful, and works seamlessly with the FSNS core design strategy. 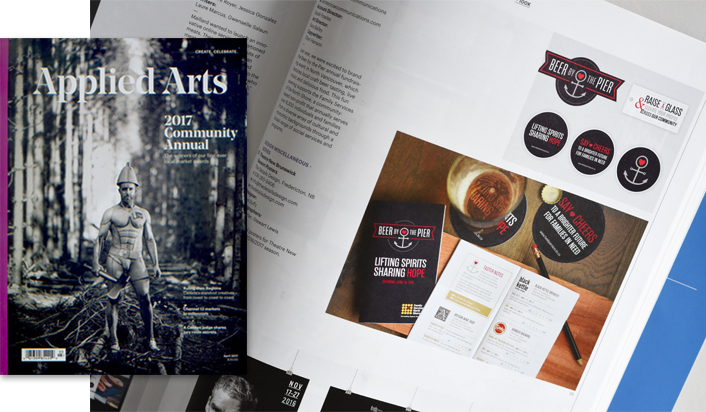 In April 2017, OUR WORK FOR Beer by the Pier won an Applied Arts magazine award in the category of Public Service / Charity design. After in-depth conversations and consultations with the FSNS team, we developed a new program tagline: Lifting Spirits, Sharing Hope. We also created secondary messaging options (including Say cheers to a brighter future for families in need”) for use on event programs,drink coasters, and in sponsorship packages and marketing materials.